We love this simple recipe for making your own elderflower cordial. Right time of year now!! Rinse the flower heads and put them in a big pot. Wash the lemons and cut them into slices. Add them to the pot. Mix citric acid and sugar and dissolve it in boiling water. 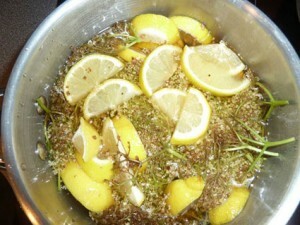 Pour it over the flower heads and lemons. Put the lid on and place the pot in the fridge for four days. Sieve the cordial and pour it into sterilised bottles. Or alternatively freeze the cordial and defrost when needed.